Video-sharing site Vimeo has introduced a mobile version of its Website to entice users of smartphones like the iPhone and Android devices. In addition to formatting the site for easier viewing on mobile browsers, Vimeo's also rolling out re-encoded versions of its content, in formats compatible with most popular mobile phones. However, not all of the site’s offerings are available for your viewing pleasure; in this first stage, Vimeo has re-encoded some of its staff picks, part of its HD video showcase, and a few of the most popular videos on the site. Vimeo's mobile home page offers a sampling of these in a long list, but no easy way to navigate or search for others. Vimeo was originally launched in 2004 by filmmakers and has distinguished itself from the video colossus YouTube by offering higher resolution videos, including 720p HD. It has tried to attract a cinéaste crowd and it bars commercial content, including TV, movie trailers, and gaming videos. Vimeo’s supporters cheer the fact that the site permits a relatively generous 500MB video upload allowance per week (or 5GB per week if you're a paying, Pro member). The choice of H.264 encoding for mobile videos is significant because it means yet another prominent site is making video available in a non-Flash format. The iPhone, of course, doesn't support Flash, and despite other platforms planning to add the capability, Apple seems to be moving firmly towards pushing standards that its device already uses. And, given the popularity of the iPhone, moving the Web towards H.264 video appears to be proving easier than waiting for Apple to decide to make nice with Adobe. YouTube, of course, is the major provider of H.264 video for the iPhone and Vimeo's mobile-friendly version will need to play catch up to the Google-owned site, which already makes most of its vast catalog of videos available in mobile versions. Newly-uploaded YouTube videos are automatically re-encoded to play on the iPhone, too, and the service also has a prime location on the iPhone’s Home screen. But Vimeo’s strategy may not be to hog all the eyeballs it can get. The company is looking to build a community with deeper interests than the run-of-the-mill kitten video. 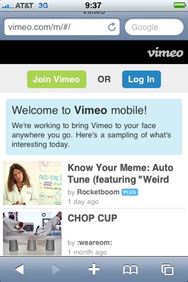 Vimeo’s initial foray into mobile video may very serve that goal.